Our relationship with alcohol is complicated – to say the least. Not everyone can hold their drink, some hold one way too often, and some don’t even get a buzz. Truth be told, we’re only just starting to get the gist of how alcohol “works”. As you may already know, alcohol is classified as a ‘depressant’. This is based on the fact that when someone develops a tolerance to valium – the ultimate archetype of depressants – they simultaneously build up a tolerance to alcohol. Valium, like most depressants, targets receptors for GABA – the main inhibitory signalling molecule in the brain. This is where things get shaky. The concentration you’d need to activate these GABA receptors with alcohol (0.33mL/L) is just above the amount that makes you embarrassingly pass out in your own vomit (0.3mL/L). Why then, do we get tipsy from just one glass of wine (I know I’m not just speaking for myself here)? And is tipsiness even the same thing as being drunk? Researchers took a closer look at GABA receptors. These are made of 5 building blocks, the combination of which differs from receptor to receptor. One particularly rare building block – the so-called delta receptor – happens to respond to very low levels of alcohol. The scientists who discovered it even call it the “one glass of wine” receptor (click the link if you don’t believe me). Using a method called PET, researchers tracked which areas of the brain are more or less active when we are drunk. They injected volunteers with radioactive sugar (it’s not nearly as dangerous as it sounds) and tracked which parts of the brain use it. It was no surprise that the three areas responsible for coordinated movement, rational thought and memory (the cerebellum, prefrontal cortex and hippocampus, respectively) were ever so slightly tuned down after drinking. Also, it just so happens that the “one glass of wine” receptors are found in exactly these three brain areas. So, that would explain why we lumber from one bad decision to another (and forget the worst ones) when we’ve had a bottle or more. The buzz part seems to be related to higher levels of noradrenaline when we drink. 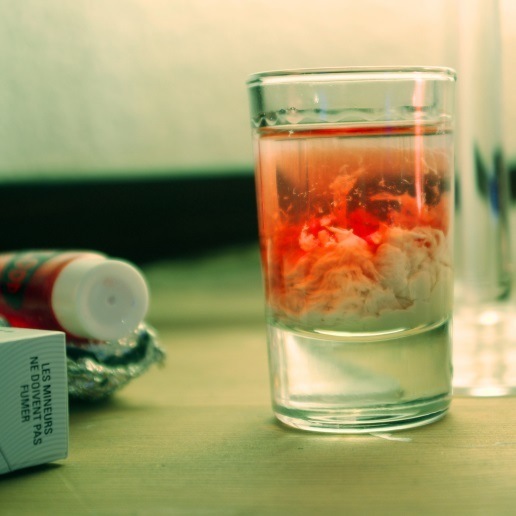 This only tends to happen when our blood alcohol content (BAC) is on the rise, leading to greater impulsivity. Once it tapers off, the effects are reversed: we feel confused, tired, restless and down – and alcohol starts acting like a depressant again. Scientists were lucky to stumble across the perfect model for human drinking culture – on St. Kitts in the Caribbean of all places (talk about serendipity). The model specimens in question are vervet monkeys, who were brought to the Caribbean over 300 years ago and have developed a curious relationship with alcohol. Back in the day, vervet monkeys would sample fermented sugar cane from the rum plantations; the modern day vervet prefers cocktails, sneakily stolen from sleeping tourists on the beach front. 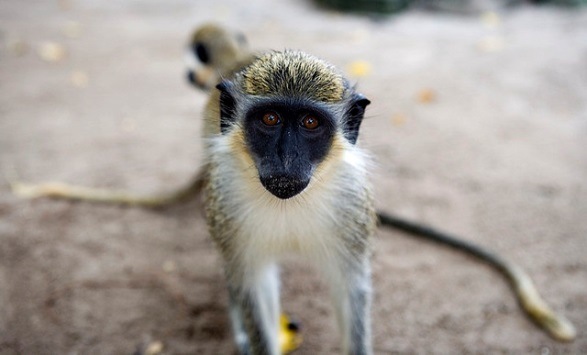 Most vervet monkeys drink in moderation; so-called “social drinkers”. Roughly 5% -given the open bar that is the lab – will readily drink themselves into a coma. 12% are steady drinkers (unlike the alcoholics, they know their limits), while one in ten is a teetotaller – indulging in soft drinks only. This distribution is strikingly similar to what we observe in humans. And the similarities run far deeper than that. Like humans, the social drinkers will avoid alcohol before noon and prefer their alcohol mixed in sweet drinks, while the heavy drinkers like to start their day with a drink – and prefer it straight. Vervets have helped researchers understand the genetics behind alcohol preference – it appears we inherit it directly from our parents. In fact, you can predict an animal’s future relationship with alcohol based on levels of neurotransmitter metabolites in its cerebrospinal fluid (CSF) before it’s had its very first cocktail. Researchers have also noticed a two way relationship between personality and alcohol preference – anxious monkeys don’t drink and those who drink become more anxious. Towards the end, the researchers pointed out one difference between vervet and human drinking culture: the social status attached to it. 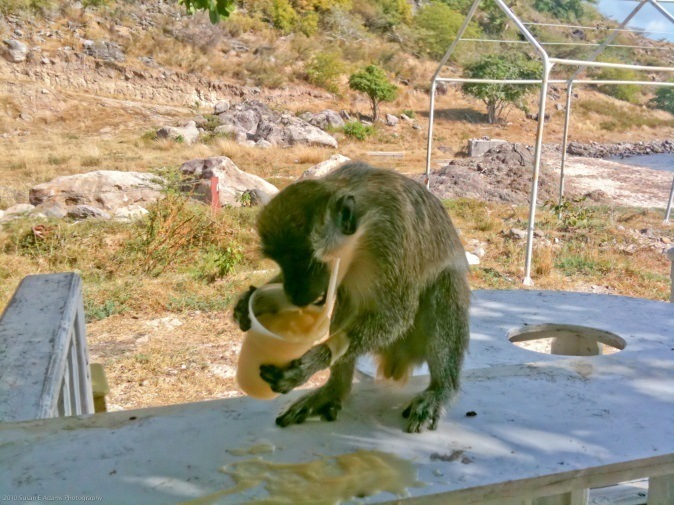 In vervets, steady and heavy bingers almost always outdrank the more responsible drinkers. Glancing at tabloid socialites, University sports clubs and most English public school students I’ve met – we may be more like monkeys than they think. No one looks pretty doing it yet somehow, when we see someone compulsively distort their face into a yawn, we feel inclined to do the same. We share this odd behaviour with a whole bunch of animals, who each do it for different reasons. Dogs do it when they’re confused, snakes do it to realign their jaws, lions do it to feign indifference in the face of combat, male penguins yawn to woo a mate and guinea pigs do it to scare enemies with their fierce incisors. You wouldn’t want to encounter this fellow in a dark alley way. Ancient Greeks and Mayas believed that yawning was the soul trying to escape the confines of the body and that it could only be stopped by covering your mouth. In Hinduism, yawning is considered a religious offense that must be repented by snapping your fingers and thumb and pronouncing the name of Raina. A more ‘sciency’ (yet equally unproven) notion is that yawning helps replenish blood oxygen. The balance of chemicals in your brain also affects how much you yawn. Endorphins (increased by exercise, orgasms and horror movies) and adrenaline, generally prevent you from yawning while serotonin (increased by most antidepressants and MDMA) makes you yawn more. Why these chemicals affect yawning the way they do is still a bit of a mystery. So why is it contagious? 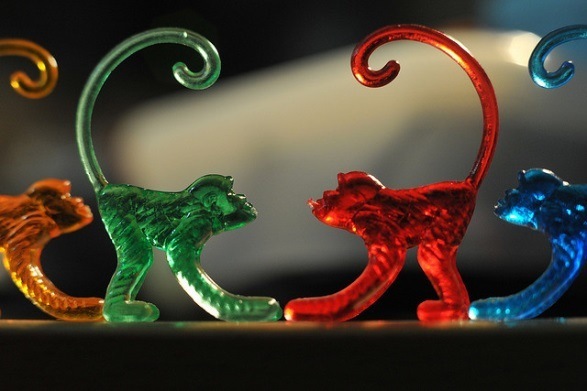 It all comes down to mirror neurons in your brain. Generally when you see someone move, certain cells in your brain tend to mimic the action. This helps us to imitate the actions of others, but also to understand them. Actually acting out whatever other people do is usually suppressed (see here for a fascinating talk on mirror neurons and their importance). In the case of yawning, it’s not. The reason it’s not suppressed might not be a coincidence – it smells of evolution. One idea is that it gets social animals to increase their vigilance as a group – so all of them keep a cool brain when on the look out for predators. It could also help signal tiredness to fellow group member, a non-verbal way of saying “it’s bed-time kids”.